THPBlog: La Tour State Forest requesting an exception to log within 30 feet of streams for fire prevention. La Tour State Forest requesting an exception to log within 30 feet of streams for fire prevention. This THP is about 11 miles NE of Shingletown, CA and 23 miles SW of Burney, CA at an elevation of 5,320 to 6,330 feet. 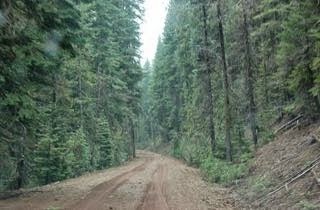 La Tour State Forest is planning a tractor and cable logging operation in ponderosa pine, sugar pine, white fir, incense cedar, Douglas fir, Jeffrey fir and red fir forests. The THP is adjacent to South Cow Creek Campground and near the Sierra Nevada crest. There is a small cave 10 feet deep by 4 feet high which the THP is named after. La Tour State Forest is proposing an exception to the Forest Practice Rules to be able to conduct individual tree and group selection logging to within 30 feet of streams for fuels and fire reduction. The desire to log closer to streams is suspect because these areas are already moist and well shaded and thus naturally fire resistant. The logging industry is pushing to log closer to streams in the name of fire prevention which coincidently is where the largest trees now remain on private/state timberlands. There are 5 unstable areas of over steepened banks along South Cow Creek. La Tour State Forest is proposing to use ground based equipment on steep slopes designated for cable logging on 75 acres. There are 26 road drainage sites planned for work including rocking, dip construction and culvert repair/replacement. A fisher was reported (2012) in section 22, a goshawk territory exists .5 mi to the west of the THP area in section 2, and a pine marten was detected in section 24 in 2005, 2006 and 2007, and in section 7 in 2010. More information is available on the THP Tracking Center website.